Home › Mahara › Community, creativity, competencies and cuteness: MUGSE comes to Sussex. Community, creativity, competencies and cuteness: MUGSE comes to Sussex. 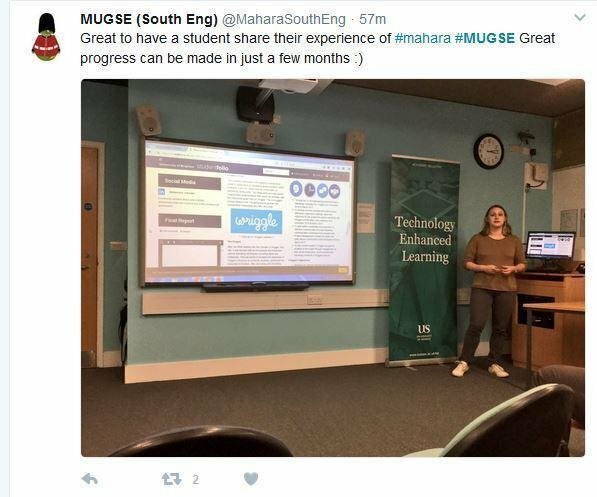 The Technology Enhanced Learning (TEL) team at the University of Sussex recently hosted a meeting of the Mahara User Group for Southern England (MUGSE). The sun shone as nearly 30 participants from eleven institutions in the region gathered to share their experiences with the e-portfolio platform and hear about new features in the upcoming release. You can see some of the tweets from the event in this Wakelet put together by George Robinson (TEL). As relatively new users of Mahara it was very useful for members of TEL to meet representatives from a wide range of institutions with diverse experiences of using e-portfolios. 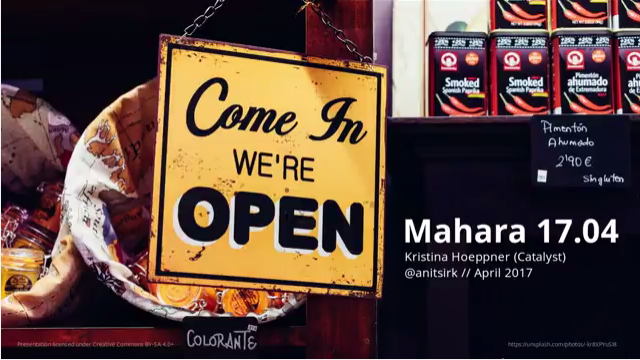 As Mahara is open-source software the community of users is absolutely central to its development and success. This was emphasized by Joey Murison (Catalyst) as he introduced some of the new features in the latest version. One example of the open software being developed by users is the AAIM Project: (Advanced Analytics in Mahara) which was presented by Antony Coombs (University of Sussex). Funded by HEFCE, the AIMM project is a collaboration between the University of Sussex and Dublin City University to bring enhanced reporting capabilities to the platform. You can read more about this project in Enhanced analytics in Mahara. Sam Taylor (Cranfield University) demonstrated a resource which she gifted to the community – a Mahara induction activity created within Mahara itself. Designed to be a ‘one size fits all induction’ the activity can be completed in 30 minutes by staff or students, either in class or independently. Sam also talked to Dan Axson about her presentation and how the MUGSE community is developing. The group was delighted to welcome a student’s perspective on using Mahara. Natascha Sturm is a Student Learning Technology Ambassador from the University of Brighton where she has used Mahara herself and helps others get started with their e-portfolios. Natascha found that users were initially scared of ‘breaking’ their portfolio and confidence and creativity came with time. This was evident in her own portfolios which had moved from the basics to more sophisticated multimedia creations. Other presentations gave a flavour of the wide range of contexts in which Mahara is being used, and highlighted some common themes. Louise Carr (Hadlow College) described how Mahara has been adopted across the college for assessment and personal / professional development. Her presentation entitled Horses for Courses gave examples of the creativity which can be expressed in multimedia e-portfolios. For very hands-on courses, an e-portfolio which allows students to showcase their skills to tutors and potential employers is a big step forward. A short video of a student handling a rabbit says much more about their skills than a written report. The cuteness continued when Ursula Bailey (Sparsholt College) showed portfolios created by trainee zoo keepers on a distance learning module. Learners’ videos showing otters and bears using the enrichment activities they had planned demonstrated how the multimedia possibilities of Mahara allow richer and more authentic evidence to be submitted for assessment. The ability to present authentic evidence is particularly important when students are working towards recognition by external bodies. Fiona MacNeill (University of Brighton) discussed this in relation to health practitioners who need to show evidence against a substantial list of professional competencies. At Sussex we use Mahara for trainee teachers to collate and present reflection and evidence of their teaching practice (see Portfolios, assessment and Mahara for other examples of Mahara use at Sussex). Fiona struck a chord with the participants when she likened creating a Mahara portfolio to curation and display in an art gallery, with ‘content’ being equivalent to a storeroom of art works and a ‘page’ or ‘collection’ being like an exhibition or display case – items from the storeroom are selected and displayed to tell a particular story. Creativity and evidence came together in a lightning talk by Nick Feather (University of Brighton) who demonstrated how film students use Mahara e-portfolios to showcase their videos alongside scripts, storyboards, behind-the-scenes photos and supporting documents. If you want to discuss using Mahara for e-submission at Sussex please contact tel@sussex.ac.uk.